This week on WELSTech, Martin is joined by teacher Rachel Feld, who makes her debut as WELSTech’s newest guest host. They talk edtech, particularly in the Apple space, and share news of Yahoo’s recent security breach, plus picks and a Reformation resource sure to thrill elementary educators. Goodbye and hello – After 8 years of guest hosting on WELSTech, Gail Potratz, Technology Director at Emanuel in New London, WI, has laid down her microphone to make room for others. Fortunately for our WELSTech community, Martin, and Sallie, we have a new “semi-regular classroom technology correspondent” to introduce, Rachel Feld, 1st and 2nd grade teacher from Bethany in Kenosha, WI. This week we get to know Rachel and learn more about iPads in her classroom. Brand new on the WELSTech Product Demo YouTube playlist is the Bloomz Overview video. Episode 465 – Join Martin and Sallie for a discussion on privacy. Release date: Wednesday, October 5. On WELSTech this week, Martin and Sallie open the virtual mail bag and share tips and tricks from listeners, including the announcement of a free Fall conference focused on gospel outreach and technology, two things near and dear to every WELSTech-er. There’s also web hosting advice, typing tutors, and fun ways to create color palettes for your next project. Community feedback feast – Martin and Sallie share all sorts of tech-in-ministry goodness from WELSTech-ers! Just in time for Reformation …. “What does this mean? The continuing importance of Luther’s Small Catechism” is the title of the current Interactive Faith series led by Rev. John Braun. Tune in on Wednesdays at 6 or 8 pm Central, September 21 – October 26. Replay the Martin Luther College live streamed presentation by Mahtob Mahmoody, author of My Name is Mahtob and daughter of Betty Mahmoody who wrote Not Without My Daughter. Episode 464 – We welcome Rachel Feld from Bethany in Kenosha, WI to the Semi-Regular Classroom Technology Correspondent (a.k.a., Guest Host) chair! Release date: Wednesday, September 28. Get ready to go social as WELSTech begins a season-long focus on social media for ministry. This month we look at the Why, What, Who and How of Instagram. There’s news from Apple and Code.org, plus a bluetooth speaker winner and even more Instagram greatness to close out the show. Don’t wait … watch or listen now! Visual communication – New this podcasting season is a monthly series titled Social Media for Ministry. The fist platform Martin and Sallie take a deep dive into is the popular image-sharing app Instagram. View the full-size Instagram for Ministry infographic and follow the links below for more details. “What does this mean? The continuing importance of Luther’s Small Catechism” is the title of the upcoming Interactive Faith series led by Rev. John Braun. Tune in on Wednesdays at 6 or 8 pm Central beginning September 21. Request the Social Media Quick Guide: Instagram from Church Tech Today’s eBooks page. Check out Instagram’s videos on Vimeo including this week’s featured video, Introducing Instagram Stories. Episode 463 – Next week the WELSTech listeners rule the roost as we share community feedback for the month. Release date: Wednesday, September 21. 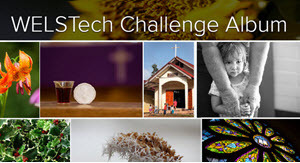 WELSTech’s 2016-17 season is underway this week as Martin and Sallie chat with photographer Naomi Green and share the latest news in tech, an upcoming streaming Bible study event from WELS, a Pinterest ministry resources (perhaps the best kind of ministry resource), picks of the week and a featured video to start the new school year. Join the conversation! Creative imagery – Photographer Naomi Green, a member of St. Peter’s in Monticello, MN and a volunteer at West Lutheran High School, joins Martin and Sallie to share her experience, tips, equipment and software choices for taking great church and school photography. Experience the First Day of High School for freshmen at Lakeside Lutheran High School, the newest addition to WELSTech’s WELS Schools playlist video.